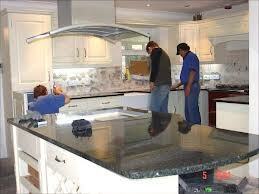 GCW Resources / Question / Question of the Day: How much of a mess am I to expect when installing granite countertops? Construction, in general, is a messy necessity. Granite Countertop Warehouse takes every precaution to reduce mess and disruption to your household. However, we remind our customers to understand that he/she is undertaking a construction project and reasonable amount of dust and debris is to be expected. We ask that you take the necessary steps to protect your personal belongings and household furniture. We suggest that you remove or at least cover all the items in your cabinets and remove all fragile items from the work area. During the removal of the countertops or backsplash damage to the drywall is likely to occur. There is the possibility that he/she may have to do a small amount of touch up painting or drywall repair.